With a rise in numbers on Instagram to over 5 million monthly users in Australia and rates of engagement 18 times that of Facebook, Instagram has become an avenue more and more Australian brands are participating on and looking to help sell goods and services. However, the challenge that brands face participating on the platform is how do they convert their followers and engagement into sales? Whilst you can now buy reach and target new audiences via the new Instagram ads platform, ideally your best customers are the ones from you existing communitywhich gets built organically and whom engage with you on a regular basis. Building a successful Instagram community means posting the right type of content that resonates with your audience, some of whom you will be able to convert into ongoing customers. However, if your brand presence currently seems stuck in a in a state of limbo with small month on month growth and static rates of engagement, one of the best places to start is to think about what the story is that you are telling your audience. This is all about crafting images that tells a story and shows how your product fits into your audience lives. It really doesn’t matter whether you are a small or larger brand if you can effectively tell your story with some hi-quality imagery and authentic posts there is a good chance you will be able to turn your Instagram page into one which helps builds a consistent revenue stream for your business. Black Milk clothing are one of Australia’s best success stories on social media and their thriving Instagram account of 1 million follower was built from the ground upwards by highlighting and looking after their community first and foremost. They are a great example of a brand that tells evokes a strong lifestyle with hi-quality photos showing off their product which is colourful with a distinct attitude. Likewise, Gelato Messina use their Instagram page effectively to highlight their new ice cream flavours, events, and training courses with the fun and irreverent personality of the brand. Honestly I dare you to look at the page and not go yum I want to try one of their new gelato flavours really! Before we discuss crafting direct sales posts it is worth looking at the science behind what makes a successful sales driving post. The guys at Buffer recently created a great post complete with infographic that breaks this down outlining the key factors to create strong sales image plus we’ve added a few of our own. Brighten it up — high lightness generates 24% more likes. Go Minimal — Lots of back ground space generates 24% more likes. Pick a Colour — a single dominant colour generates 17% more likes than multi-colored images. Spend time to research your hashtags and which ones apply to your target market to get your posts found. Make sure you use Geo tag all of your posts if you want to get your place of business found! How often? On top of your day to day lifestyle and engagement posts how often you post direct sales posts depends upon your frequency of posting. Once a week if you are posting twice a day or once every 10 days if you are posting 4/5 times a week is perfectly acceptable as long as you do not post them all the time and alienate your community in the process. By sales posts we refer to explicit sales posts with a strong call to action see below examples. However make sure you either have something new to offer your followers or likewise are running a sale. Creating a sense of urgency with captions like “for one day only” will also increase take up. When? After an Instagram promo (which we will cover in more detail in the next section) is a good time to run a sale when you will have additional eyeballs. First off focus on pulling together your graphics, captions and links and start putting a posting strategy schedule together that outlines your plan. if it is a promo, sale or a new product alert let your audience know in advance with a teaser post so youraudience are primed whilst your announcement post a few days later should be explicitly more sales and have a clear call to action either in the image or as part of the caption. Above all making sure you give your posts context so your audience know why you are posting a direct sales post. Is it a launch is it a new season sale, or are you celebrating the brands birthday? Context is everything to ensuring your sales posts are well received. See some more examples below of these type of posts you can work with. 3. Make it easy for your audience to find out more information about your products and services via a landing page. The traditional way to do this is to provide a link on your insta profile to your website and a lot of effective brand on Instagram will include current campaigns however on an ongoing basis it is also worth thinking about using a landing page that hosts content designed specifically for Instagram that gets mentioned in your posts. The problem with Instagram at the moment is that unless you are using Ads you only have one link to play with so directing your potential customers to a landing page where you can host a series of information that you make available depending upon what post directed them there I the first place. You can also offer your Instagram only fan exclusive sales opportunities. See the ShortStack landing page below which neatly highlight all its product suite for brands. The benefit of this is that it will allow you to track click and conversions that lead directly from your Instagram efforts and lead your customers more quickly down the path to purchase. 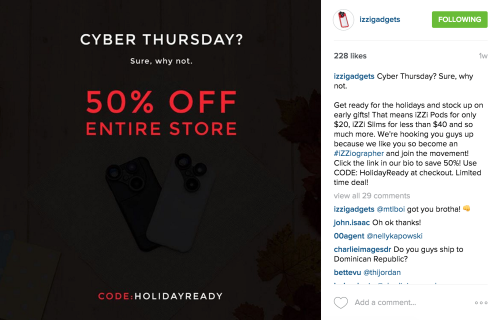 Almost all of your Instagram traffic will be coming from mobile and should be optimized accordingly. Make sure that your page is responsive to cater to a variety of mobile devices to maintain a quality user experience for your shoppers. Make sure you consistently test and improve your page’s design and trying out different call to actions and images on your posts to learn how your landing page can better convert traffic into sales in the long term. Location is at the heart of everything posted on Instagram and running a location based promo is perfect for those brands running events or with a physical retail location. This where really knowing your audience and their habits pays dividends and running an Instagram contest that taps into your community culture to engage and drive sales in the process is a great option for small or larger businesses. During the 2014 Soccer World Cup Evolve Social in conjunction with the location based marketing platform Mapkats ran a promo for Rebel Sport that tapped into fans passion for their country to ‘Show their Colours’. We did this by asking fans to go in-store and purchase a jersey, hat or scarf of their national team and post a selfie of themselves on Instagram with the campaign hashtag to go into the draw to win a $1,000 gift voucher every week of the world cup. These pictures were then pulled in and posted to a photo album on the rebel Facebook page via the Mapkats Marketing Platform for their fans to vote on and one winner was picked each week from those with the most likes. Utilising the user-generated content from the contest resulted in a huge uplift of organic reach and engagement and most importantly record sales of merchandise. See the full case study. The opportunities for brands with location marketing on Instagram we believe is the next big untapped opportunity for brands and sponsors alike. Tip: Some of the most successful promos encourage fans to do more of what they are already doing. Much has been written about the advantages of influencer marketing and now it is common place to see a feed of different posts from influencers promoting a whole variety of products who are simply paid just to post a product on their feed but with very little thought for their community and how this will convert into real sales for the business. However, done well influencers can be an important way to drive sales and help tell your story in an authentic way vs spending money on ads. Nowhere has the use of influencers in driving awareness, brand engagement and sales than in the tourism and leisure industry. One particular Australian brand that caught our eye this year was Flight Centre AU. Their use of social influencers to promote their Open my world hashtag to their target 18-35 audience has amassed over 97,000 photos since October 2014 through the various influencer campaigns they have run in conjunction with Tourism New Zealand, Tourism Tasmania and MTV. So successful was the strategy in Australia that the open my world that is has been rolled out globally for the brand. Speaking to their Social media lead Joanne Heggie, she told us that their influencer programs had not only helped them increase awareness on the path to purchase, but also utilise user-generated content on their own social channels to fuel the sales drive to these destinations in a more authentic and engaging way. So if you’re thinking of going down this road or have already paid influencers part of a brand campaign make sure you present a brief to them fits in with yours and their community culture and they actually like the product and are not working with too many other brands already. Most good influencers these days are a lot fussier about whom they work with so having a clear vision of what you want to achieve is vital if you are to achieve your goals working with influencers. One new Australian initiative that is looking to help brands and influencers work better together is Tribe which is touting itself as a marketplace for social influencers.So if you’re a Australian brand or agency that’s is having trouble working out the best way to connect with influencers and are not sure of their value as you often hear of crazy prices being quoted to work with influencers give Tribe a look. We will definitely be keeping our eye on this Australian Start up to see how it develops and what appropriate market value it places on respective influencer posts. (No vested interest). With the advent of Instagram advertising the platform is on a mission to prove it can drive sales through its Shop Now button and Carousel ads however since it has opened its ad platform to all buyers, there have been signs that the quality of the sponsored posts has gone down. The challenge is for Australian brands to be more creative to engage with their audiences and convert more of their followers into paying customers through an organic content strategy and make social media work for their brands. By all means use ads to target new audiences but don’t let us turn instagram into a purely direct response mechanism for sales so it loses it way like Twitter.